The Frenchman's Food & Wine Blog: La Lola, Hampden Road - Revisited! La Lola, Hampden Road - Revisited! Luckily for us, we arrived minutes after someone had left, so we only had to wait 5 minutes for a table. Just in the nick of time I say, because two other groups of diners turned up minutes after. We got a table in a great location on the sidewalk, cleverly screened from the road by a light hedge in a row of planters. So where was I? 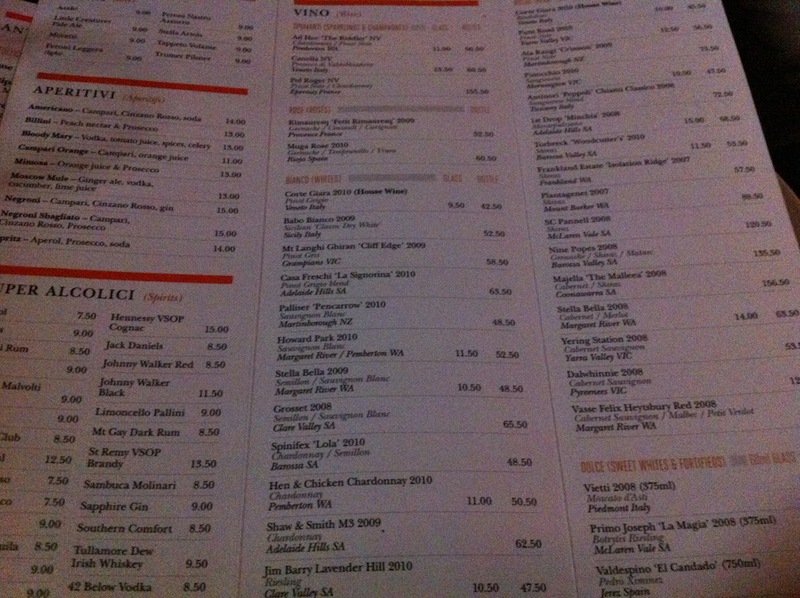 Yes - the wine list. 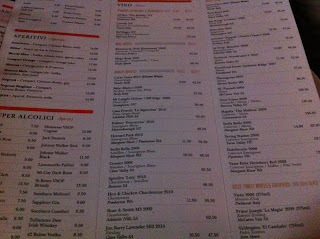 For a small restaurant, this place boasts a most impressive wine list indeed. Great names abound - Pol Roger, Howard Park, Grosset, Jim Barry, Punt Road, Ata Rangi, Torbreck, Majella, Charles Melton's Nine Popes, Yering Station and Dalwhinnie; plus a goodly selection of Italian offerings. I chose a bottle of the Antinori Peppoli - we were eating in an Italian restaurant after all, and one of my favourite wines of all time is the legendary Antinori Tignanello. And that winemaking skill is evident in the Peppoli - a delicious, palate filling sangiovese. So good that we polished off the bottle before we realised it. 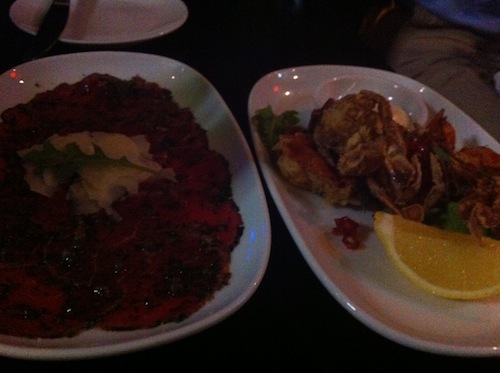 This time around, we chose the soft shell crabs and carpaccio as a shared entree. The carpaccio was just as good as I remember - love the subtle aroma and flavour of the truffled oil! And how can you not enjoy soft shell crabs deep fried in batter? Ah, that sublime juxtaposition of crunchy battered exterior and soft, slightly chewy interior, with a flavoursome mix of crisp fried chilli, spicy rocket and a delightful aioli dip. For my main, I ordered the risotto - featuring prawn, saffron, tomato, chives and mascarpone. Sinfully rich mascarpone - but as Venetia remarked, all the good things in food are fatty, natural and delicious - butter, cream, cheese, and of course, mascarpone. This was delicious - attested to by the fact that I completely cleaned out the plate with nothing but a fork. Venetia ordered the linguine which I had the last time (clearly their best pasta dish, in my opinion!) and also thoroughly enjoyed it, although she promptly suffered from dish envy when she saw the well-sauced older fellow get his Strozzapretti: twisted pasta, Italian sausage, crushed peas, basil pesto and pecorino cheese; and again when someone else got their parpadelle with veal and porcini mushroom ragu, rosso vermouth, basil and grated parmesan. Next time I say! La Lola - the place to go for great food, excellent wine and people-watching light entertainment!